Upon closer inspection, I realized that it would not be totally utilitarian. 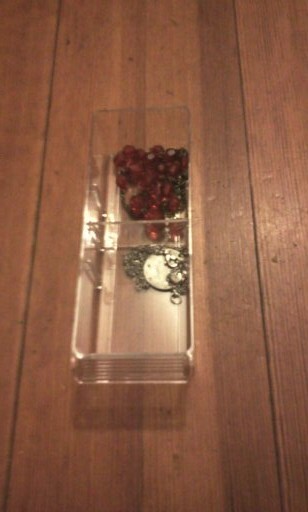 I needed additional space for hanging my 30" length necklaces as well as additional room for my bracelet watches & charms. I continued on with my search for the perfect jewelery armoire. However, my stash was getting out of control, this is a pic of some of my jewelry stash that was now spilling over into my bedroom from the sewing room (which also serves as my dressing room). 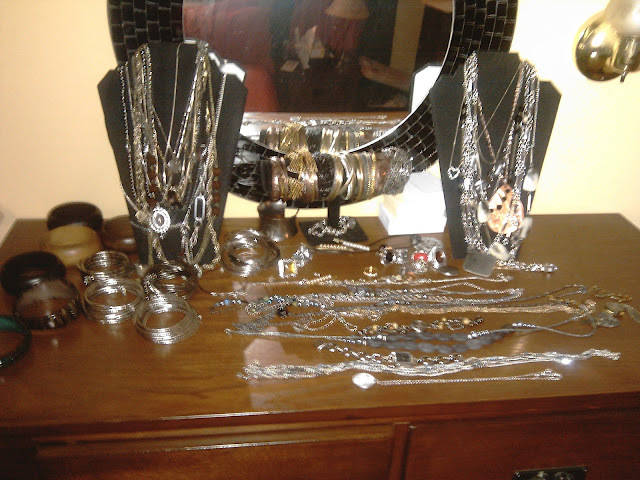 Once the sewing room went through a makeover and it was decided I would get a jewlery armoire to house my stash, I moved all the jewelry into my bedroom, which became a heaping hot mess. I arrived home yesterday, entered my bedroom to see that one of the necklace display had fallen and with it went the jewelry that was laying flat on the dresser...uggh.... a heaping mess on the floor. My guy heard me scream (it was more along the line of OH MY GAWD.. HOW THE HELL!!!) and came rushing into the room... wondering if I'd fallen or something. Only to his surprise I was having a hissy fit over the jewelry mess on the floor....lol He left the room muttering that he was going to put an end to my silly shinangans as well as some expletives... *_0. I really had a fit when I picked up a heap of jewelry...some of it was tangled... double dayummm. 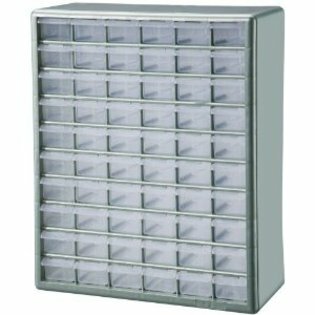 My guy returned with one of his parts organizer from the garage, which has 60 small compartments. He didn't even ask if I liked it... mounted it on the wall and walked out. Now, I'm wondering if he has an organizer for all my handbags... ^_^... but dare not ask him...lol. Shelia that is so cool! He really is a keeper but I do have a better suggestion. Just give me all of your purses and jewelry and it won't be a problem for you anymore! I solved this by buying bedroom furniture that has the jewelry drawers in the armoire and dresser. Now everything is laid out and perfect but this is a pretty good solution too! 19 years together.... he is definitely a keeper. @ Carolyn, I love bedroom furniture with those features. Our bedroom furniture, the landscape mirror dresser has 9 drawers & a cabinet with 3 smaller drawers behind it which makes it great for jewelry & ties and the Chest drawer has 6 drawers with two smaller ones for undergarments, but have since modified them to house perfume/cologne & toiletries, so that the top of the dressers stay clear of clutter. I needed organization for the custome jewelry and didn't want it in the bedroom and love the idea of it being mounted on the wall in my sewing room. That's a great idea! 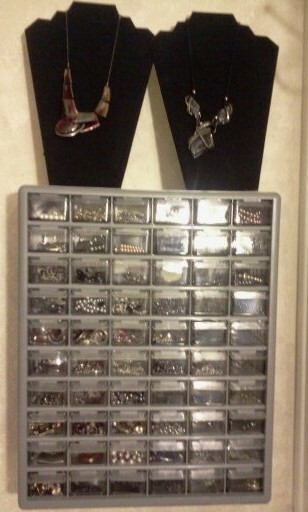 I use the same parts organizer as a way to organize my buttons and other small notions by color. Neat-o-keen way to keep everything straight. Can you use google reader on your smart phone. I have problems with it on my phone. This is really cool Sheila! Your guy did a wonderful job..
You guy is awesome. 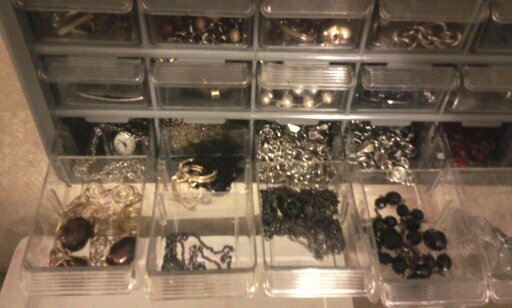 I have my jewelry pretty well organize. But I like the storage container your guy came up with. Faye, yes I can access google reader from my phone. I log in and then save the page to my phone's desktop, which creates an icon & offers quick viewing.